Do you belong to one of the MISSION CRITICAL industries? Are you a FUTURISTIC Manager? Do you know how important ESD is in the Electronics Industry, especially ‘Mission Critical’ Industries? Do you know the hazards caused by ESD? OPGM is a unique workshop exclusively designed for futuristic leaders related to Mission-Critical industries and high-tech electronics industries. It has been proven time and again that Electro Static Discharge (ESD) is a significant menace to any Mission-Critical industry. Apart from the loss of billions of Dollars each year, many a time human lives are also lost due to the lack of awareness …. and the situation continues. In today’s challenging and competitive scenario, leaders related to these vital industries who are ignorant of the Cost of ESD, may not be able to take their companies to the next level. Moreover, it is a matter of social and moral responsibility once human lives are being affected. 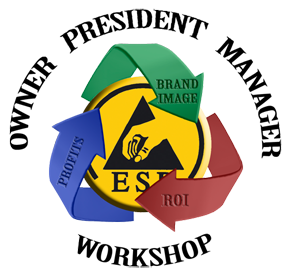 Viewing from a sharp angle, the leader will be unsuccessful in measuring or calculating the Return on Investment (ROI) on ESD without the necessary awareness of Electrostatics. This one-day program offers – All the necessary knowledge needed to identify, evaluate and judge the Level of Protection needed for their industry requirement, their ESD Protected Areas and the competence of their technical team concerning ESD awareness. Staying constantly updated with the latest technical developments is the only way to solve ESD issues with the ever changing technology in the industry. Compliance Verification checks and periodic testing ensure proper functioning of the ESD Control system and prevents issues related to quality, customer satisfaction etc. DON’T FORGET – an authorized ESD FACILITY AUDIT CERTIFICATION can fetch you joint-ventures or contracts worth millions! Identifying the right ESD Vendor. An ESD Vendor is totally different in comparison with vendors of other industries – he is the Process Owner. As ESD is NOT a serious part of the curriculum in universities worldwide – a trained, knowledgeable vendor with years of experience and exposure only can ensure a trouble-free performance. ESD CAN TURN YOUR PRODUCTS TO TOAST IN 1 NANOSECOND!